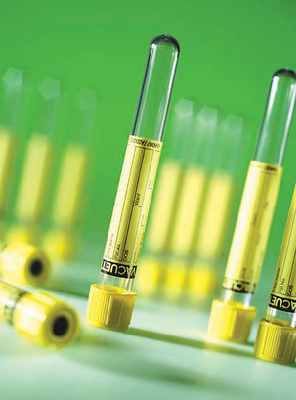 Urine tubes are designed for use as collection, transportation, or analysis vessels. VACUETTE® urine tubes are also available with or without a stabilizing preservative. Tubes containing a preservative are intended for use with specimens that cannot be analyzed within two hours of collection, specimens being tested for an otherwise unstable analyte, or specimens being stabilized for microbiological studies. Tubes with preservative should be inverted 6–8 times following collection in order to acheive homogenous mixing. Available in round or conical bottom formats. Round bottom tubes are used for chemical urine tests. Conical bottom tubes are used for microscopic examinations of urine sedimentation. All tubes are supplied with yellow caps.